At this rate, they’re going to have rename Friday Night Lights to Friday Night Frights for the Virginia football team at Scott Stadium. 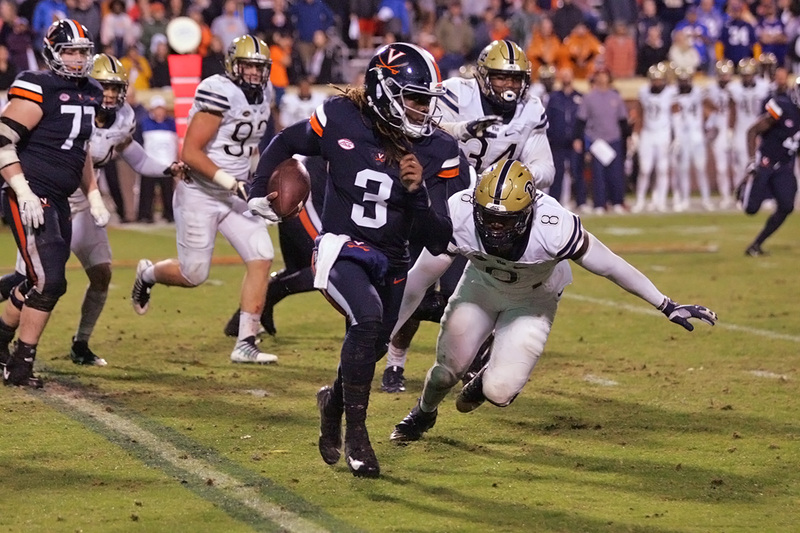 For the third time in four seasons, the Cavaliers dropped a Friday night home game in dreadful fashion as Pittsburgh pulled away to a 23-13 win to take control of the ACC’s Coastal Division race. The game opened in a downpour and UVA looked sluggish for much of the night even after the rains cleared. The performance carried similar frustration to a 2015 Friday night loss to Boise State, which featured a just 40 rushing yards for the Hoos in a much more lopsided score (56-14), and the 2017 Friday night defeat to Virginia Tech, which saw the Cavaliers put up 9 rushing yards in a close loss (10-0). The game may have felt out of sync because it was missing some of the important ingredients to the winning formula from October. In the three-game streak against Miami, Duke, and North Carolina, the Cavaliers shut down the run for the most part, at least held their own in the trenches, avoided penalties, got off the field on key third downs, and came up with some explosive scoring plays. Those wins featured at least some, if not all, of those elements each week. Against Pittsburgh, that recipe blew up like a Beaker experiment on the Muppets. The Hoos couldn’t get the run going with Jordan Ellis or Perkins, while simultaneously allowing the Panthers to churn out rushing yards. The Hoos ended up with 44 rushing yards, while allowing 254 rushing yards and a pair of explosive touchdown plays on the ground. Miami, Duke, and UNC had rushed for just 273 yards combined. That contributed to Pitt winning the time of possession battle by almost five minutes, a category that had been slanted UVA’s way in all three wins last month. Virginia couldn’t get off the field in the third quarter when Pitt took the lead for good. The Panthers did not convert a third down in the first half, but then rattled off four of five in the third quarter. They finished 6 of 14 combined on third and fourth down plays. The offense didn’t capitalize on some chances either other than a 42-yard touchdown catch for Terrell Jana that took advantage of missed coverage by Pitt. Otherwise, an Evan Butts’ fumble, a Chris Sharp dropped pass, a missed opportunity to close the first half with a touchdown thanks to some lost time on the final drive, and other missed openings jumped out as the biggest examples of missed chances. The Cavaliers were not as clean with their play as in recent weeks either. They set a season high for penalties with 10, which cost the team 80 yards. Entering the game, Virginia had logged just 34 penalties in the previous eight games combined, a 4.3 penalties per game average that was tied for seventh nationally. The flags were often for controllable miscues like false starts and offsides. Many of them came early as the team committed seven penalties for 55 yards in the first quarter alone. Ultimately, that’s where the most frustrations bubbled up after the game for the Hoos. Mendenhall mentioned inadequate preparation and concentration issues as the chief areas of concern afterward. The penalties, missed run fits on defense, sacks taken on offense, and the like all carried a common thread in his mind. They each showed a lack of execution, a lack of focus, or both. Did the Hoos have a Halloween candy sugar crash Friday night? Did they wilt under the pressure of being ranked? This is, after all, the fifth loss in the last six tries as a ranked team for the program, though most of those losses came many years back in 2007 or 2011. Or maybe it was the pressure of being in a division title hunt and in the driver’s seat there? Maybe it’s just a Friday Night curse? Players said after the game that they didn’t sense added pressure from the rankings and race so they didn’t see that as the root cause. That may have been the most frustrating part for the Hoos in the wake of the loss. They simply couldn’t identify the why behind the focus and execution issues. And, worst of all, they didn’t really see it coming. As Ellis suggested, the preparation during the week felt solid, but it didn’t hold up at game time in an important game for the division title race.